Coming soon to a 911 call center near you! At this time, Scott County does NOT accept text messages to 911. 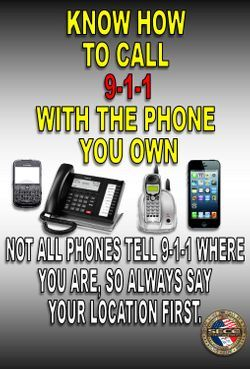 Please dial 911 in the event of an emergency from your phone. 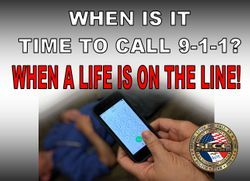 The use of 9-1-1 is for life and death emergencies or any situation needing immediate police, fire or EMS response. If there is ever any doubt if a situation is an emergency it is better to dial 9-1-1 and allow the 9-1-1 dispatcher to make the determination whether or not emergency assist is needed. What happens when calling 9-1-1? When calling 9-1-1 the dispatcher that answers your call is going to need specific information from you, having the following information available will allow the operator to expedite your call and get you the help you need in a timely manner. Staying on the line- do not hang up until instructed to do so by the dispatcher. Follow all of the instructions as provided. While the dispatcher is asking you all of the questions and gathering information, he or she is also entering the information into the computer aided dispatch system (CAD). As this dispatcher is typing another dispatcher is talking to the officers and/or firefighters to send them to assist you with your emergency. You speaking to the dispatcher and answering all the questions does not delay the police/fire response, in fact, it assists the responders in serving you more efficiently and effectively. Do I have to leave my information when calling 9-1-1? Due to fear of retaliation many times callers like to remain anonymous, we understand this concern and again want to reassure our callers, by staying on the phone with the dispatcher and relaying any pertinent information will not put your anonymity at risk. If you wish to remain anonymous just advise the dispatcher of your request; however, it is important you still leave a call-back number in the event the call gets disconnected or additional information is needed. The 9-1-1 dispatcher will have the ability to assist non-English speaking citizens through the assistance of a language line service. This service provides over 140 different languages. Should a translator be needed in any situation, there may be a brief pause at the beginning of the call followed by a few beeps. Please do not hang up the phone, the dispatcher is exchanging credentials with the Language line and obtaining a translator. It is very important this process not be interrupted as interruptions may cause delay in the processing of the call. 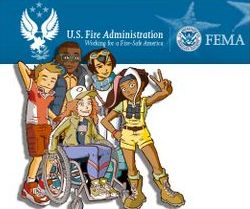 9-1-1 Services are accessible to all hearing impaired individuals; there is no separate number to be dialed as 9-1-1 can accept all TDD (Telecommunications Devices for the Deaf)/TTY (Teletypewriter) calls. All calls received by a TDD/TTY device are answered in the same way as any other emergency call requiring police/fire/EMS service. What happens if I dial 9-1-1 by mistake? 9-1-1 dispatchers are trained to get the most important information as quickly as possible to get help on the way to an emergency situation. If you happen to call by accident, stay on the line until you can tell the dispatcher you called by accident and there is no emergency. This saves the dispatcher from having to call you back and confirm there is no emergency or sending police with lights and sirens to check your address for an emergency. What do I do if I have a question about how a 9-1-1 call was handled? Should you ever need any information regarding any 9-1-1 call or incident, you can request that information through the Freedom of Information Act (FOIA) by contacting us via our contact link or e-mailing our FOIA Officer; Denise Pavlik at denise.pavlik@scottcountyiowa.com or calling 563-484-3000 for additional information.